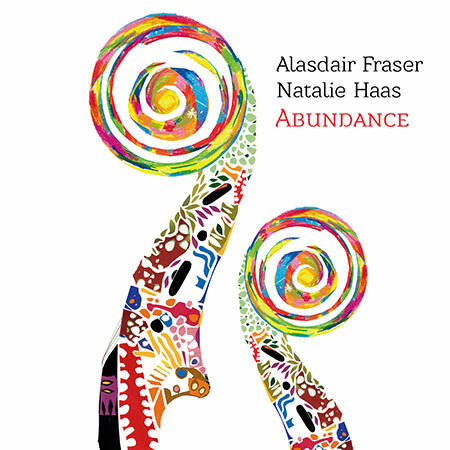 Greentrax Recordings is again delighted to release another album from the hugely talented fiddler Alasdair Fraser and the wonderful cellist Natalie Haas. Alasdair, a Scot now domiciled in the USA, teamed up with Natalie Haas some years ago to form this highly acclaimed duo. Alasdair (fiddles, baritone fiddle, viola, kalimba) and Natalie (cellos, kalimba) invited eight special guest session musicians to join them on this album: Donald Shaw (accordion), James Macintosh (percussion), Corey DiMario (bass), Dominick Leslie (mandolin), Brittany Haas (fiddle), Hanneke Cassel (piano), Stefan Amidon (percussion), Kai Welch (trumpet) and Oscar Utterström (trombone, bass trombone, euphonium). The tracks are a wonderful mixture of the old and new, including several by Alasdair as you might imagine. One tune titled The Referendum was written by Alasdair for the occasion of Scotland’s First Minister Alex Salmond’s visit to Alasdair’s fiddle course at Sabhal Mor Ostaig on the Isle of Skye – and to celebrate the upcoming referendum. There are also four tracks listed under the heading Connie’s Suite – a commission from Howie Muir for his wife Connie’s birthday. The Muirs are long-time friends and dance has been an important element in Connie’s life. Each movement of the Suite is inspired by a difference dance form.